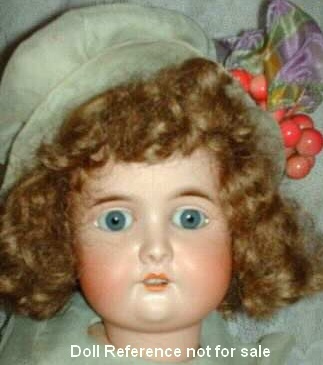 Wislizenus bisque socket head Dolly face doll, 24" tall, composition jointed body, sleep eyes, open mouth, doll marked A.W. 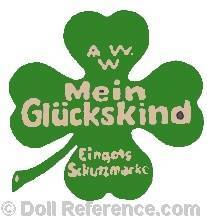 Special Germany. 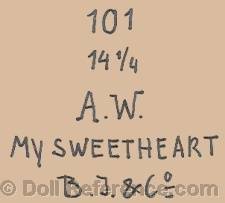 Gottlob Schafft founded this doll factory in Waltershausen, Germany in 1851 to make papier-mâché dolls that were also exported, by 1870 Adolf Wislizenus joined the firm as a partner, around 1878 Mr. Wislizenus became the sole owner. Over the years this company changed ownership several more times, until 1931 when they went into bankruptcy, at which time Konig & Wernicke acquired the estate. Their bisque doll heads were supplied by; Bahr & Pröschild or Simon & Halbig, after 1910 by Ernest Heubach or Armand Marseille. Wislizenus dolls are of very good quality, some doll bodies have a unique ball jointed construction, they made; wax heads, figures & animals, mechanical toys, Täufling, Dolly face, Unique Body Child dolls, Character Baby dolls, mechanical walking dolls, painted eye dolls, a doll named Gretchen, 1902 Old Glory doll, 1910 Queen Quality doll & 1919 Mein Glückskind (My Lucky Child). 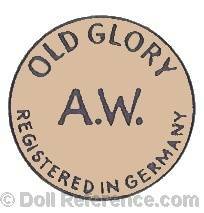 Wislizenus dolls may have been distributed in the USA by Hamburger & Company. After 1931 Konig & Wernicke used Wislizenus patent Certa head for their Nicaput doll. 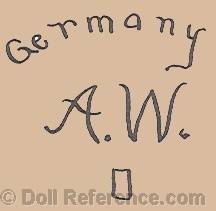 Adolf Wislizenus doll mark Heubach Köppelsdorf A.W.W. 101, 110, 290, 295, 1105.